Sports & Fitness & Leisure. 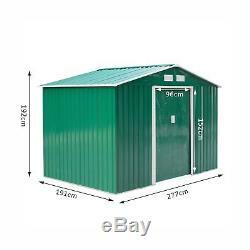 Outsunny 9x6ft Garden Shed Outdoor Foundation Storage Unit Metal Tool Box Green. 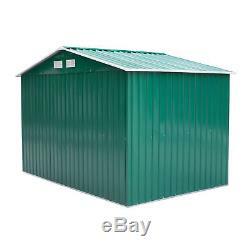 This Outsunny metal shed is an ideal solution to have in your garden, A great place to store tools, garden equipment, or any items you need to store. 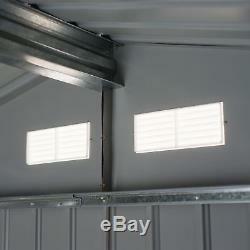 Made from metal and plastic components, and also has air vents for airflow. The whole structure is painted to blend in with surroundings. 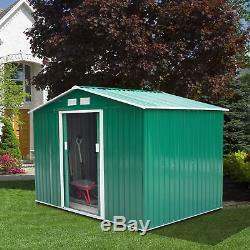 It can be used as a storage solution or as a work shed. 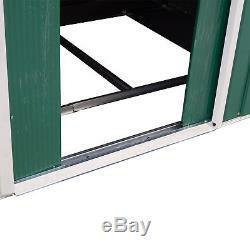 Made from Metal and polypropylene plastic components Easy to slide door for convenient opening and closing Door is lockable for added security Four vents for air circulation Shed for organizing gardening tools, chairs, sundries or other equipment Maintenance free for many years A protective film on metal panels for long term use Foundation allows the shed sitting evenly on floor. (Flat surface Required) Easy assembly required. 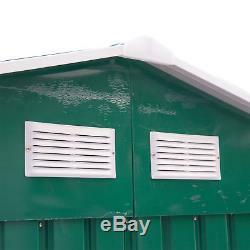 Material: Colour plate, polypropylene Colour: Deep green wall, door and roof, white door frame, eave frame and windows Net Weight: 65kg Overall Dimension: 277L x 191W x 192H (cm) Shed Interior Dimension: 267L x 181W x 192H (cm) Wall Height: 152cm Door Size: 96L x 152H (cm) Window Size: 21.8L x 9.8W (cm) Color Plate: 0.025cm thickness Custom Label:845-031GN Please Note: Tools in the shed are not included. MH STAR verifiably manages retail globally with branches in US, Canada, Germany, Spain, Italy and France, we now welcome you to benefit from our prices in the UK. 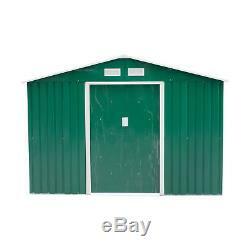 Here at MH STAR, our point is to give you the most ideal choice of great quality on affordable items. Our quality essentially represents itself. All MH STAR items come exclusively from our carefully picked, quality assured alliances. Our goal is to keep up exclusive expectations for the value and services to ease your life. In the event that you require any assistance, kindly don't hesitate to get in touch with one of our accomplished and friendly advisors who will be glad to help, our customer service aim answer to your enquiries within 24 hours. 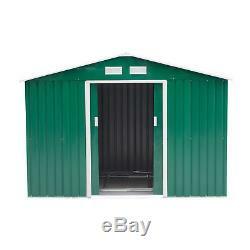 We are unable to change this address for your own safety once the order has been placed. If you change your mind and wish to return the unused items to us, it must be done so within 30 days of the item being delivered. However, if you have any issues in regard to your order, we have a dedicated UK based customer service centre who will be delighted to help and resolve any issues that may arise. This can be done using the "attach photos" tab located underneath the message box. We aim to respond to all emails within 24 hours and will do all we can to resolve any issues as efficiently as possible. I have changed my mind; can I cancel my order? 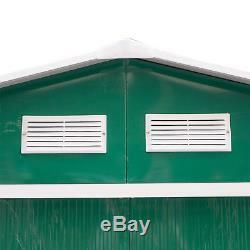 Please note: If the goods are accepted/signed for, we will not be liable for the return costs. Can I collect my order? We do not offer customer collection as we operate from multiple storage facilities across nation that do not allow public access. 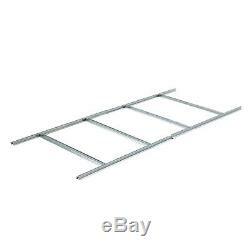 You can also benefit from free collection at your nearest Argos by ensuring to choose this option at checkout. When will I receive my order? Are you able to deliver outside of the UK? How do I track my Item? Once dispatched, your consignment can be tracked (if tracking is available) online via the courier website. I would like my parcel to be left in a secure location, can this be done? I need a VAT Invoice, can this be provided? 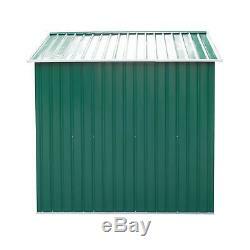 The item "Outsunny 9x6ft Garden Shed Outdoor Foundation Storage Unit Metal Tool Box Green" is in sale since Thursday, July 7, 2016.